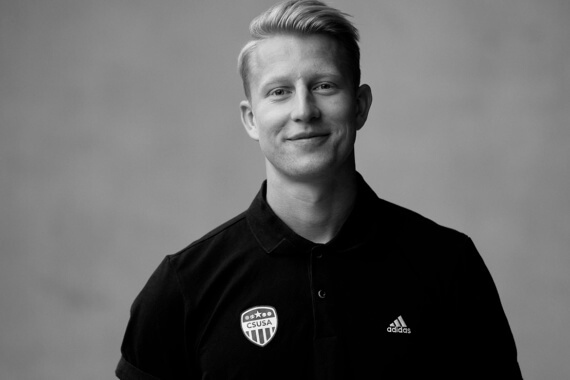 Frederik Frankman is a Recruitment Consultant working primarily with our Danish student-athletes and is based in Copenhagen. He has been part of Team CSUSA since his graduation from college in June 2017. Frederik Frankman from Copenhagen, Denmark, is a former CSUSA-client and played two seasons at Coastal Carolina University (in South Carolina) in NCAA D1, winning the Big South championship and reached the Sweet Sixteen of the NCAA Tournament. He transferred to the University of Texas Rio Grande Valley where he was a part of the first generation of the men’s soccer team, also in NCAA D1, playing as a left back and center back primarily. Academically, Frederik majored in Business Management, finishing his Bachelor degree with a GPA of 3.68 in May 2017. Before heading to the United States, Frederik played for 2.Division team HIK and Fremad Amager in Copenhagen, Denmark and was for a short period a part of the U15 Danish national team roster. In his last college season Frederik received several honors and awards such as “Attacking Player of the Week” with three goals in three games and got named Western Athletic Conference Second Team Player, while being on the Dean’s List maintaining a GPA of 3.5 and above. Scoring three goals, two of them being direct freekicks and one being a bicycle kick at the edge of the box, in three games as a center back for UTRGV, leading the team to its first ever Western Athletic Conference tournament.